Comcast recently convinced me to upgrade from a internet only package to a internet + limited basic cable package, which with the promotional discount was cheaper than just internet. Comcast limited basic cable is relatively useless. I get channels 2 through 33, most of which are not english channels, and are not in HD. When the promotional period expires, I plan on cancelling cable and keeping only internet. About 2 years ago, I had used a VERY OLD set of rabbit ears to get FREE HDTV channels, which worked well for basic channels. The unit was compartively large (approximately 1 ft x 1ft x 1ft footprint plus two rabbit ear antennas) and the signal would often times cut in and out. Despite getting FREE HDTV channels, I eventually discarded the antenna due to its unstable connection and large footprint. All in all, purchasing an antenna is a great investment. 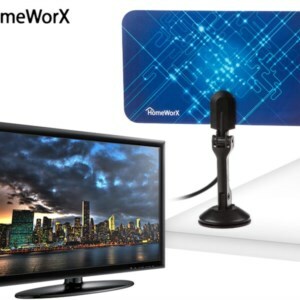 I purchased the Homeworx HW110AN HDTV Flat Antenna for $7.99 + tax + free shipping = $8.71. Without a doubt, Comcast cable must be costing more than $8.71 per month! For those who live further north of Sunnyvale (closer to San Francisco), you are likely to receive more channels with a stronger signal.